Giving new meaning to the term? From the Lagrange County IN Amish settlement. More on the Amish phone. I well remember those times. You made your calls very carefully and usually had half a dozen calls to make while in the shanty. The pet-peeve was when the person on the other end wasn’t at home, because I had to walk all that distance in vain. I would really stop and ask myself, is this call really important, if not then I would wait until I had more than one call to make. But, it definitely would be good exercise, but would be dangerous in an emergency. I liked the picture. Even though no commentary is necessary, I missed Erik’s usual accompanying article. I also wanted all of you sharing on Amish America, I really like reading all the comments. Erik, keep up the good work. Thanks for being on Facebook; it makes it easier to remember to check in for new articles. Thank you Carolyn, I enjoy the comments too. I try to post these new posts pretty regularly on Facebook so people know about them. There are some pretty nice bordering on fancy ones out there Forest. Are the Amish at all embarrassed about going to the phone shanty? Is it risky, like, “I came out here twice last week…I hope no one’s keeping count!”? Does an Amish person who needs to use the phone more often than others appear busy and important, or do they appear potentially sinful? Just wondering what emotions are experienced when using the phone, and what sort of stigma, if any, are connected with frequent callers. Lattice, great question. You know a lot of calling can be business related or simply speaking with family in other communities. Clearly there are necessary calls and I think it’s hard to begrudge anyone staying in touch with family in another state. Some communities are no doubt more comfortable with phone usage than others. But that said I’ve never really asked anyone how it might be perceived. I would also enjoy hearing from someone with Amish background on this too. 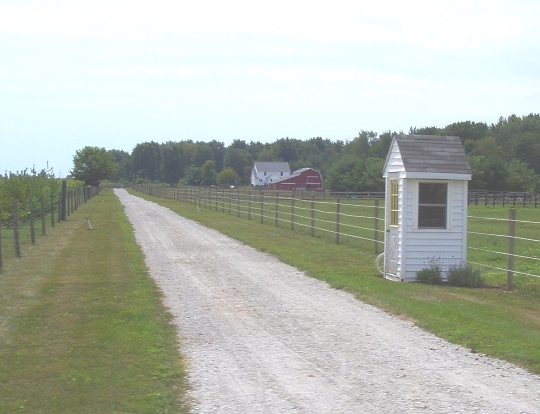 In Parke County, Indiana, the telephone shanties are usually right beside the workshop. James you are right, in some communities they’ve walked themselves up pretty close to the shop and even home. Parke Co. are Lancaster-origin people. We need more phone shanties! When it became obvious that cell phones were here to stay, and I had embarrassed myself multiple times by “answering” someone who was using their “hands free” blutooth phone, I decided that bringing back phone booths would be an excellent idea. The person needing to make a call would have privacy (and shelter from the elements) and the rest of us wouldn’t have to listen to one-sided “conversations” that usually run on far too long and are far too loud! Besides, there’d be advertising potential (slap ads all over the walls)! Alice Mary cell phones I’ve encountered are typically just owned by one person. Some may place self-restrictions on their usage, like using them within certain hours. Perhaps those bluetooth people could wear a special see-through sound-proof phone shanty on their heads, in order to speak in private and leave others in peace as well? Just a thought. That sound proof phone shanty for the cell phone users head sounds like a winner. Ever notice how the mood changes when you are in some nice quiet little out of the way place sharing a nice romantic meal with the one you love and some bozos cell phone goes off? Naturally they have to answer it in THE LOUDEST VOICE POSSIBLE AND OF COURSE, CONTINUE TALKING THAT WAY FOR THE ENTIRE CONVERSATION! This person has been sitting there quietly enjoying the evening with their spouse or whoever and you never even knew they were in the room. Suddenly their phone rings and they become a human incarnation of Fog Horn The Leghorn … I SAY BOY, I SAY BOY!!!!. Yep, that sound proof head shanty would come in pretty handy just about then. Cram it down over their head and go back to enjoying your otherwise peaceful evening. I’ve noticed some people seem to think: the louder the voice, the more important the person. This practice makes sense to me. I like the idea of keeping phones away from the home. I wonder though, do the Amish, in their phone shanties, use answering machines or answering services to retrieve missed phone messages. Shom they do use answering machines or voicemail, that is very common. In my area many of the Amish business men (especially contractors) have and use cell phones on a daily basis, mostly for business purposes. The phones at home are in shops, barns or sheds near the house (many times within 6-10 feet of the house). I have noticed in my taxi work that most of the young people (age 16 and up) have cell phones. When I’m taking a load to another community on the weekends (rumspringa) the cell phones come out, the texting starts and both of my power ports are requested so they can recharge phones. Cell phone usage is not so different from englisher teens but I think is is not as open at home. Some of my lady customers ask to use my cell phones when they are on taxi trips. This varies greatly between families, some being much more conservatie then others.